However, ants clearly are fundamentally different from us. 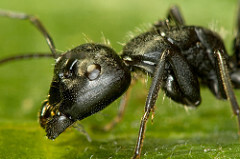 A whimsical example concerns the work of ant morticians, which recognize ant corpses purely on the basis of the presence of a product of decomposition called oleic acid. When researchers daub live ants with the acid, they are promptly carried off to the ant cemetery by the undertakers, despite the fact that they are alive and kicking. Indeed, unless they clean themselves very thoroughly they are repeatedly dragged to the mortuary, despite showing every other sign of life. That comes from Tim Flannery's review of The Superorganism: The Beauty, Elegance, and Strangeness of Insect Societies. Pretty much every paragraph of the piece is worth blockquoting, so you may as well just read the whole thing.